One of the most fascinating aspects that continually draws me into the medieval era, is the mystery and antiquity of castles. Of course, living in western Canada affords little opportunity to see castles first hand. 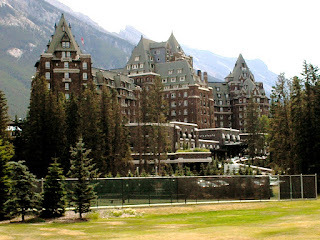 The closest I can come to experiencing a medieval castle is visiting the Banff Springs Hotel. It has a medieval theme throughout and even a wonderful great hall. I love castles, everything about them. I think that's why I'm always writing in the medieval era - it was vastly different, more violent, crueler. This opens up a realm of opportunities for heros to stand out. 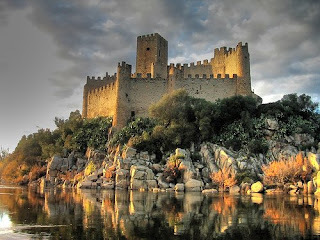 Here is a fascinating article I found about medieval castles and how they were built. I give the author credits at the bottom of the article. Around the tenth century the first castle-like structures were being built as defensive positions. These defensive structures were called Motte and Bailey and they were large mounds of dirt that were capped by wooden stockade fences and buildings. Hundreds of these structures were built during the century and they were very practical because they were made from local and easy to get materials. They didn’t require the massive resources that later stone castles would require. During the eleventh century many changes were sweeping through Europe and among these changes was an engineering revolution that enabled architectural building with stone. But this engineering growth alone was not enough for the building of large fortresses because that required a substantial commitment of time, resources and money. But there was also a social change sweeping through Europe. Lords and Kings were consolidating large kingdoms and gaining the wealth that made the building of large stone castles possible. In order to protect their lands or to gain a hold in adjoining lands lords and kings built stone fortresses. These stone fortresses were very similar to the Motte and Bailey structures of the previous century and they were often called "shell-keeps". It was during the fourteenth century that the building of castles went into decline and then its eventual demise. Further developments in technology, and in particular the development of gunpowder and artillery brought about the demise by making it impractical and futile to spend ten years or more to build a castle that could be totally destroyed by a few days of artillery fire. But the castle didn’t disappear. It evolved into less of a security structure and more of a living quarters for royalty and wealthy families or what we now think of as a Palace. The medieval castle was an amazing art and engineering form that evolved dramatically over a period of about five hundred years and reflected changes in warfare, culture, engineering and society.